The constitution of the Chinese government guarantees its citizens "religious freedom." However, since the Chinese Government views religion as a threat to its power, it restricts religious activities to only government-sanctioned organizations and registered places of worship. It also actively seeks to stamp out those religious activities that are not government-sanctioned. The Chinese Religious Affairs Bureau screens religious groups for official approval or disapproval, monitors membership in these organizations, controls locations of religious meetings and training, selects religious hierarchy, censors publication of religious materials, and funds approved religious activities. Those religious groups that do not submit to the government guidelines and are not willing to allow a secular and government agency to dictate its religious activities face severe consequences: surprise raids, heavy fines, imprisonment, torture and even revoking priestly/episcopal title as well as its duties regardless of Pope's approval. China turned Communist in 1949. Almost immediately, the new Communist government started putting pressure on the Roman Catholic Church. In 1951, the papal nuncio, Archbishop Riberi, was expelled from China. The Chinese government formed the Three Autonomies Movement to organize the clergy to abandon the Holy See under the excuse of patriotism and nationalism. By 1953, many Chinese and foreign bishops and priests and laypersons were arrested. Many died in jail. Pope Pius XII, in his encyclical Ad Sinarum Gentem on October 7, 1954, warned the Chinese pastors that "the Three Autonomies" seeks "to establish finally among you a national church which no longer could be Catholic . . ." In 1955, a mass arrest took place in the Shanghai diocese by the Chinese government. In one night on September 8, 1955, more than 200 clergy and faithful, including Bishop Ignatius Kung, the Bishop of Shanghai, who refused to support "the Three Autonomies" movements to be independent of the Holy See, were arrested. 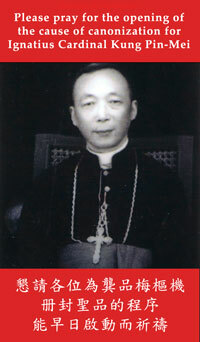 Bishop Kung's fidelity and resistance was an inspiration for the bishops and thousands of Catholics throughout China. The unyielding fidelity of these pastors and the blood of the martyrs encouraged the entire Catholic community in China. Failing to eradicate the Catholic Church, the Chinese government created in 1957 its own Church, called the Chinese Catholic Patriotic Association (CCPA). The Catholic Church in China, therefore, has two faces: the government-established Chinese Catholic Patriotic Association (CCPA) and the Roman Catholic Church (RCC) that became illegal in China and was forced underground. Chinese Catholic Patriotic Association (CCPA) -- The Chinese Government officially recognizes only those pastors who openly declared their independence from the Holy See and joined the autonomous CCPA. The CCPA takes its orders only from the State Council's Religious Affairs Bureau, which is an agency under the United Front Department of the Communist Party. It does not recognize the supreme administrative, legislative, and judicial authority of the Pope, even though it does recognize the Pope as "the spiritual leader" of the Catholic Church. The CCPA, for example, has appointed and ordained its own bishops mostly without the permission of the Pope, especially in the early days. It does not take its mandate from the Pope. It does not recognize the Pope as the leader of the universal Roman Catholic Church. It declared its autonomy from the Pope. Therefore, it does not recognize that the Pope has authority over the Catholic Church in China. Apparently referring to the CCPA, Pope Benedict XVI said: "the proposal for a Church that is independent of the Holy See in the religious sphere is incompatible with Catholic doctrine. The claim of some entities . . . to place themselves above the bishops and to guide the life of the Church does not correspond to Catholic doctrine. . ." In his speech on December 3, 1996, the late Pope John Paul II, apparently referred to the CCPA as "a Church which does not respond to either the will of the Lord Jesus, or to the Catholic faith." Roman Catholic Church (RCC) Commonly known as Underground Catholic Church -- A Roman Catholic must accept the supreme authority of the Pope as the leader of the universal Roman Catholic Church, no matter how unfavorable the circumstances are. A Roman Catholic cannot accept just any other Church (like the CCPA) as a substitute without abandoning his faith and status as a Roman Catholic. A Roman Catholic in China therefore cannot join the Patriotic Association. Through the many encyclicals and apostolic letters, Pope Pius XII, Pope John Paul II and Pope Benedict XVI have repeatedly reminded the Catholic Church in China of this basic doctrine of the Catholic Church. 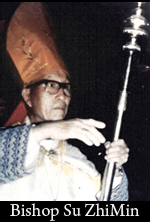 The Roman Catholic bishops in China were steadfast in their loyalty to the Holy See as reflected by Bishop Kung's response to the Chief Prosecutor of the Chinese government when the Prosecutor tried to offer Bishop Kung the leadership in the "Three Autonomies Movement" on the eve of his trial in 1960: "I am a Catholic bishop. If I leave the Holy Father, not only would I not be a Bishop, I would not even be a Catholic. You can cut off my head, but you can never take away my duty." For this, Bishop Kung disappeared in a Chinese jail for more than 30 years. By remaining loyal and obedient to the Pope, and by remaining in full communion with the Holy Father and the universal Church, the Roman Catholic Church in China is outlawed by the Chinese government and is generally known as the underground Church. The late Pope John Paul II, in his message to China on December 3, 1996, proudly proclaimed the underground Catholic Church in China as "a precious jewel of the Catholic Church" and said: "The Bishop must be the first witness of the faith which he professes and preaches, to the point of 'shedding his blood' as the apostles did and as so many other Pastors have done down the centuries, in many nations and also in China." Paraphrased below are His Holiness Pope Benedict XVI's elaborations in his letter to China in 2007 on status of the various bishops currently in China. "Some Chinese bishops, who have received episcopal ordination in communion with the pope, not wishing to be subjected to undue control exercised over the life of the Church, and eager to maintain total fidelity to the pope and to Catholic doctrine, have felt themselves constrained, not without suffering, to opt for clandestine underground consecration. The Holy See hopes that these legitimate pastors may be recognized as such by the civil government. Other pastors, however, under the pressure of particular circumstances, have consented to receive episcopal ordination without the pontifical mandate, but have subsequently asked to be received into communion with the pope. The pope has granted them the full and legitimate exercise of episcopal jurisdiction. Unfortunately, some of these legitimized bishops have failed to provide any clear signs to prove that they have been legitimized. Finally, there are certain bishops - a very small number of them - who have been ordained without the pontifical mandate and who have not asked for or have not yet obtained the necessary legitimation. According to the doctrine of the Catholic Church, they are to be considered illegitimate but validly ordained as long as it is certain that they have received ordination from validly ordained bishops and that the Catholic rite of episcopal ordination has been respected. Therefore, although not in communion with the pope, they exercise their ministry validly in the administration of the sacraments, even if they do so illegitimately." Even to this day, the Chinese Government considers the part of the Roman Catholic Church that is still underground illegal. Thus, Holy Mass, catechism classes, priestly/episcopal ordination, baptism and other religious services for many Roman Catholics that are still underground must be conducted in private homes and in secret with risks of exorbitant fines, imprisonment, house arrest, physical tortures, and labor camp internment. One of the oldest Marian shrines in China is Our Lady of Dong Lu in Hebei, approximately 100 miles from Beijing. It is the home to 40 of the 120 martyr saints canonized by Pope John Paul II in October 1, 2000. During May each year for the last approximately 100 years, there were continued pilgrimages from thousands of Catholics throughout China. However, in April and May, 1996, the Chinese government mobilized 5000 troops, supported by dozens of armored cars and helicopters, destroyed and leveled that Marian shrine, confiscated the statue of the Blessed Virgin Mary and arrested many priests. Currently, every one of the approximately 25 underground bishops of the RCC is either in jail, under house arrest, under strict surveillance, or in hiding. Bishop SU Zhimin, the underground Bishop of Baoding, Hebei was arrested in 1996, escaped, and rearrested in 1997. There has been no news on this bishop for many years. 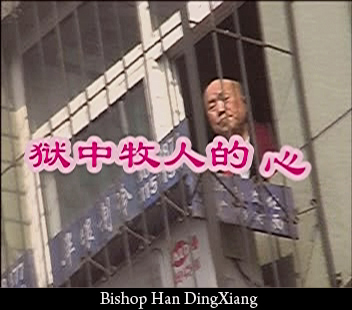 Bishop SHI Enxiang, underground Bishop of Yixian, Hebei, was arrested on April 13, 2001. He is now more than 80 years old and has been detained for more than 10 years. We do not know his whereabouts or his condition. 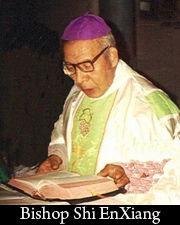 Bishop GAO Kexian, Bishop of Yantai, Shandong, was arrested in October, 1999. We did not know where he was until he died in jail in January 2005. His cause of death is unknown. Bishop YAO Liang, the auxiliary bishop of the diocese of Xiwanzi in Hebei, was arrested on March 31, 2005, released, and arrested again on July 30, 2006. He died in 2009. Bishop ZHAO ZhenDong, Bishop of Xuanhua in Hebei, was arrested in December 2004. He died shortly after he was released. He was 87 years of age. Bishop HAN Dingxiang , Bishop of Yong Nian, Hebei, was arrested in December 1999 and was held in an unknown place for his last two years. He died in 2007 in a very suspicious situation. He was cremated and buried within six hours of his death without any religious ceremony. These are only a few examples. Priests, seminarians, nuns and laypersons face similar harassment. Many of them are in jail or in labor camp. In 1997, the Cardinal Kung Foundation published a secret Chinese government document entitled "The Procedures Legally to Implement the Eradication of Illegal Activities/Operations of the Underground Catholic Church." This document recommended steps to be taken to destroy the Underground RCC. These steps included "destroy[ing] the organization of the underground Catholic underground forces," "cut[ting] off foreign contacts with local illegal elements," and "destroy[ing] the Church's illegal assembly place[s]." On January 26, 1997, the New York Times referenced this document in an article entitled "Catholics in China: Back to the Underground." 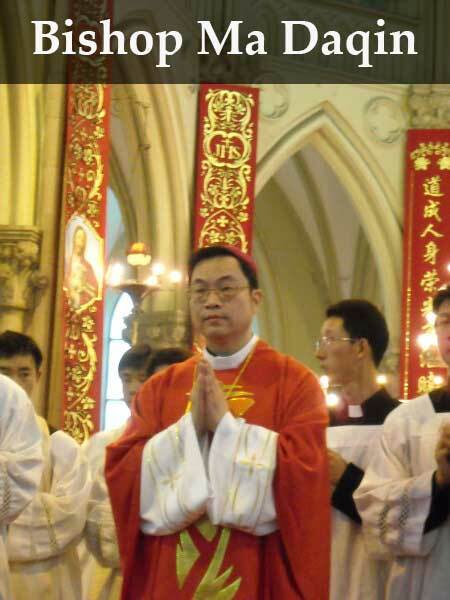 On July 7, 2012, Father Ma Daqin, with the approval of the Holy See, was ordained auxiliary Bishop of Shanghai. During the ordination ceremony, Father Ma avoided the embrace and communion with an illicit Chinese "Catholic Patriotic Association" bishop who was present in the ordination ceremony. In his homily after his ordination, Bishop Ma announced that the would henceforth devote himself fully to his pastoral mission and consequently quit the Patriotic Association (CCPA), which is an organization which according to Pope Benedict XVI is "incompatible with Catholic doctrine" and pursues a policy of "independence" from the Holy See. Immediately after his ordination, Bishop Ma was placed under house arrest in Sheshan Regional Seminary and he is still under this house arrest. Bishop Ma has not only been forbidden to wear any Episcopal insignia (pectoral cross, ring, barette, etc), but also his Episcopal title and offices of the "auxiliary Bishop of Shanghai" has been revoked by the Chinese authorities' so called "Bishops' Conference" which has never been recognized by the Holy See. "No conference in the world has the power to appoint or revoke a bishop, least of all by this so-called "conference", which is not recognized by the Pope" said Archbishop Savio Hon Tai-Fai who is the Secretary of the Congregation for the Evangelization of People. The points described above are but a few of the many examples of the harsh and ongoing religious persecution of the Underground Cahtolic Church clergy and laypersons in China. 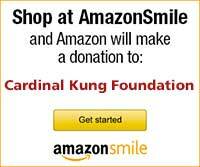 The Cardinal Kung Foundation has documented many other instances in its press releases and other reports. These press releases and reports can be viewed and obtained on our Press Release page. In view of the points described above, the religious persecution of underground Roman Catholic in China is obviously not ancient history. The persecution continues and gets worse and bolder at a time when China is making significant economic progress, at a time when China has joined the World Trade Organization, and at a time when China has become an important member of the international community, including the host of the Olympic Games, which represent the spirit of peace. The U. S. State Department has named China a country of particular concern (CPC) for more than a decade for its "systematic, ongoing, and egregious violations" of religious freedom. "It must not be forgotten that many bishops have undergone persecution and have been impeded in the exercise of their ministry, and some of them have made the Church fruitful with the shedding of their blood," said Pope Benedict XVI in his letter to China on May 27, 2007.
there must be "authentic religious freedom" in China. The Holy See "desires to be completely free to appoint bishops." It is indispensable that, when legitimation of once illegitimate CCPA bishops has occurred, it "is brought into the public domain at the earliest opportunity, and that the legitimized bishops provide unequivocal and increasing signs of full communion with the Pope." The need to "purify our memories, to pardon the wrong-doers, to forget the injustices suffered, and to restore the troubled hearts to serenity in order to grow and to make visible the bonds of communion between the faithful and the pastors of the Church in China. It is "indispensable…..that every bishop should be in communion with the other bishops, and that all should be in visible and concrete communion with the Pope." "The date May 24 could in the future become an occasion for the Catholics of the whole world to be united in prayer with the Church which is in China. . ."